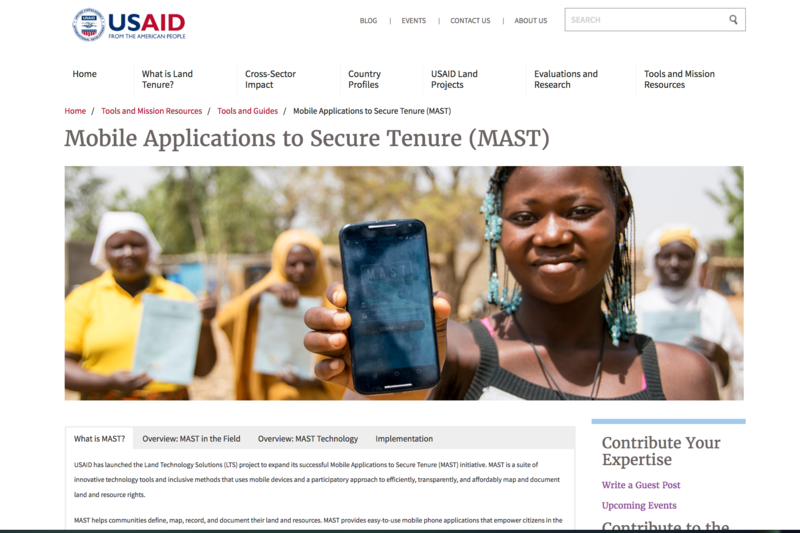 The USAID E3/Land and Urban Office recently launched the MAST Learning Platform, an interactive digital resource site that brings together tools, technical documentation, software code, demos, and lessons learned from the Mobile Applications to Secure Tenure (MAST) projects in Tanzania, Zambia, and Burkina Faso, as well as work performed under the three-year (2017-2020) USAID Land Technology Solutions (LTS) Project. The LTS Project, which is designed to refine MAST and support its expansion into new countries, offers USAID Missions and implementing partners a variety of tools and services. These include the design or support to land mapping activities and pilot projects, development of country-specific customized MAST technology solutions, or training to build mapping capacity at the local, regional, and national levels. The MAST Learning Platform is a knowledge portal that centralizes information, tools, lessons-learned, and best practices from existing MAST projects, as well as upcoming MAST activities under the LTS Project. Through the Learning Platform, users can access details and lessons learned from current or past MAST projects in Tanzania, Burkina Faso, and Zambia, as well as guides on how to use the MAST participatory approaches and technology. Users can also find information, access the MAST code, or even contribute to the MAST software development at the MAST software Github. The platform is a living resource and will feature regular updates and contributions from MAST users and projects. The MAST Learning Platform is an interactive hub that provides a central, one-stop-shop for documentation, analysis, and resources from MAST projects in Tanzania, Burkina Faso, and Zambia, as well as upcoming new MAST projects to be implemented by the Land Technology Solutions Project and via other USAID programs. The Learning Platform serves the broader development sector, as well as specific communities of practice, including USAID Missions and implementing partners. Users are invited to contribute information or posts or follow and attend upcoming events. The resources on the platform make it easy for USAID Missions to integrate land or resource mapping into economic growth, value chain, market development, biodiversity conservation, women’s economic empowerment, and other programming. The Platform contains tools, implementation guides, lessons-learned, case studies, video demonstrations and more, and is updated regularly with new offerings. The platform features an interactive demonstration of the MAST application used in Tanzania so users can explore how the mobile application functions to inventory and document land information. You can also access the software code or contribute to the software development through the MAST Software Github. Using MAST participatory approaches and tools helps vulnerable populations clarify resource rights. In turn, this directly supports USAID strategic priorities outlined in the Global Food Security Strategy, USAID Gender Equality and Women’s Empowerment Policy, the USAID Biodiversity Policy, and more. Unclear or insecure property rights contribute to conflict over land and natural resources and can undermine efforts to promote women’s empowerment, reduce poverty, develop markets, or strengthen agricultural value chains. This is particularly true where land governance is weak and demand for land from individuals, communities, companies, and governments has increased. The MAST Learning Platform includes examples of how MAST has been used successfully in the field to map and register community and individual resources. 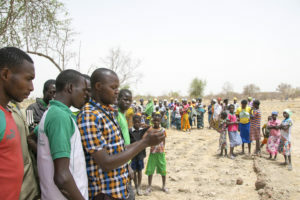 In Burkina Faso, MAST improved the ease with which people and communities could record their land rights, reducing the potential for conflict over land. In Tanzania, the MAST community participatory mapping process helped identify and negotiate family land allocations, potentially avoiding or resolving lengthy family land disputes. Participants in the MAST process in Tanzania noted that they expected conflicts would decrease in the future because their land rights had been clarified and secured. For more examples, see MAST in the Field. The LTS project offers services to USAID Missions and partners through integrated knowledge transfer, capacity building, and technical assistance. LTS is designed to enhance MAST and support its integration into new projects. LTS can help Missions integrate land and resource mapping into new project design or provide technical assistance to rapidly deploy pilot activities. LTS can also provide guidance in local customization of the MAST technology and tools. Please see the LTS Fact Sheet for more information. Guidance in the design of specialized land or resource mapping activities. Training and capacity building for host-country counterparts and USAID Mission staff. Technical guidance and needs assessments for the development of country-specific, customized versions of the MAST technology. Technical assistance to incorporate land or natural resource mapping into existing or upcoming programs. To learn more: www.land-links.org/MAST or see the LTS Fact Sheet.